Ofra Highlighter Palette All Glowed Up is the palette for a perfect glow! This luxurious palette with 4 highly pigmented best-seller highlighters is suitable for all skin tones and tones. The palette includes: Beverly Hills Highlighter, Rodeo Drive Highlighter, Blissful Highlighter, Star Island Highlighter. Thanks to the innovative liquid to baked technology and the clarity of the pearls, this highlighter gives an unprecedented glow. 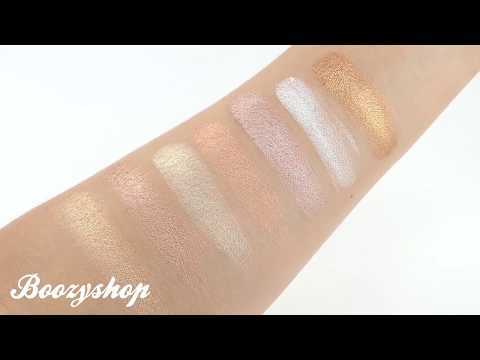 All highlighters in this palette are easy to blend and can be worn individual or mixed for a unique highlight. This palette is everything you need for a radiant look from morning to evening, because the highlighters are longlasting! Contains 4 shades of highlighter. Use a highlighter brush . Apply to the inner corners of the eyes, on the eyebrow bone, cupid arch and along the tips of your cheekbones. Blend the highlighter nicely with a blending brush . Use a powder brush to apply the highlighter on the shoulders or dÃ©colletÃ© for an extra glow. Mica, Zinc Stearate, Nylon-12, Aluminum Starch Octenylsuccinate, Magnesium Aluminum Silicate, Silica, Trimethylsiloxysilicate, Dimethiocone, Ethylene / Acrylic Acid Copolymer, Phenoxyethanol, Triethoxycaprylysilane, Ethylhexyl glycation. May Contain: Cl 77891, Cl 77492, Cl 77491. Contains : 3 x 4 g. / 1 x 10 g. .